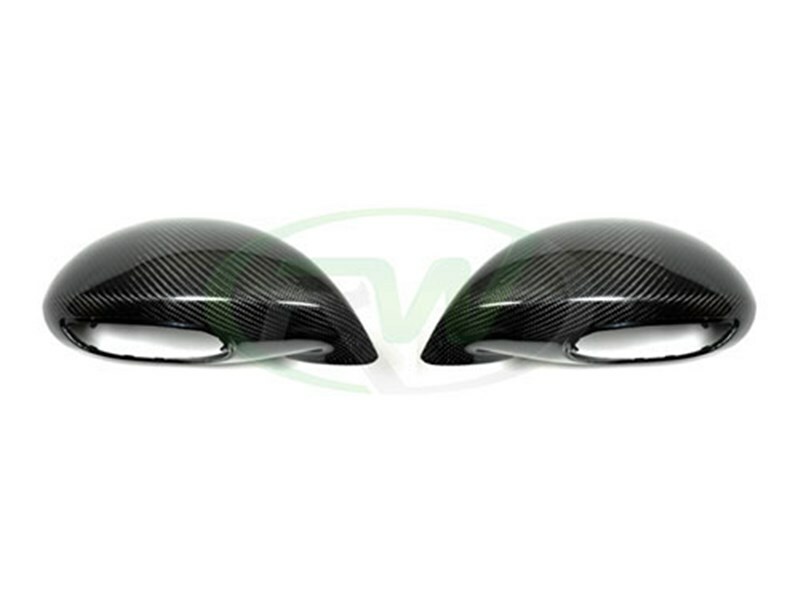 These Porsche 991 Turbo, GT3, GT4 Carbon Fiber Mirror Cover Replacements feature high quality 2x2 carbon fiber construction that is finished with a clear coat to maintain a shiny appearance and prevent damage from road debris. These replacements simply install over your existing mirror covers and offer an appearance upgrade for enthusiasts wanting to enhance the exterior tone of their car. The RW Carbon Porsche 991 Turbo, GT3, GT4 Carbon Fiber Mirror Replacements are crafted from 100% non-recycled raw plastic to ensure that the clips and tabs will not chip away or break off easily. The genuine 2x2 carbon fiber construction matches perfectly with RW Carbon interior accessories, diffuser, front lip, and trunk spoiler on your vehicle. Choose RW Carbon for your Porsche 991 exterior carbon fiber accessories and get a great looking and fitting product the first time. RW Carbon highly recommends that all of our parts are installed by a professional. These mirror replacements are installed by mounting directly into the same locations your existing mirror covers are currently mounted in. Simply remove the factory mirror housing, and replace with the carbon fiber replacements. We know there are many companies out there claiming to have the best carbon fiber exterior additions for your Porsche. Many other competitors will ship you a product that comes straight from overseas - without taking the time to quality check it. This runs the risk of receiving a product that is damaged, has irreparable scratches or possesses overall poor quality carbon fiber construction. At RW Carbon we pride ourselves on taking the time to quality check each and every item we ship out. By choosing RW Carbon we make the promise to deliver you a consistent, high-quality product that is shipped from our Southern California location - the first and every subsequent time you order from us. Additionally, all products shipping from our warehouse are meticulously inspected, and carefully packaged to ensure you receive the best possible carbon fiber mirror replacement for your Porsche 991 Turbo, GT3, or GT4.